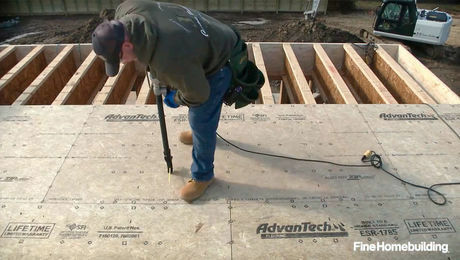 Structural insulated panels (SIPs) are large building components made of rigid foam (either expanded polystyrene or polyisocyanurate) faced on both sides with oriented strand board (OSB) that are used as floors, walls, and roofs. 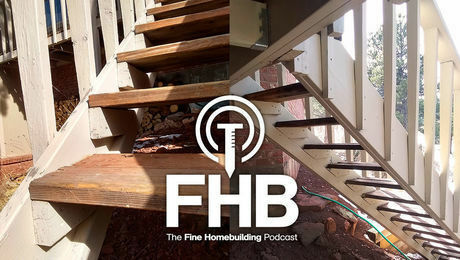 The panels usually include 2x lumber captured between the OSB around the perimeter and are typically joined at the seams with splines and screws. 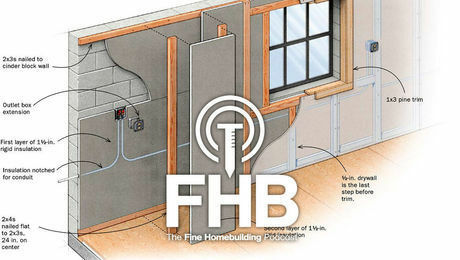 Wherever there is a seam in a home’s thermal envelope—between a window and a rough opening, or between a concrete foundation and the mudsill, for example—there are opportunities for air leakage. 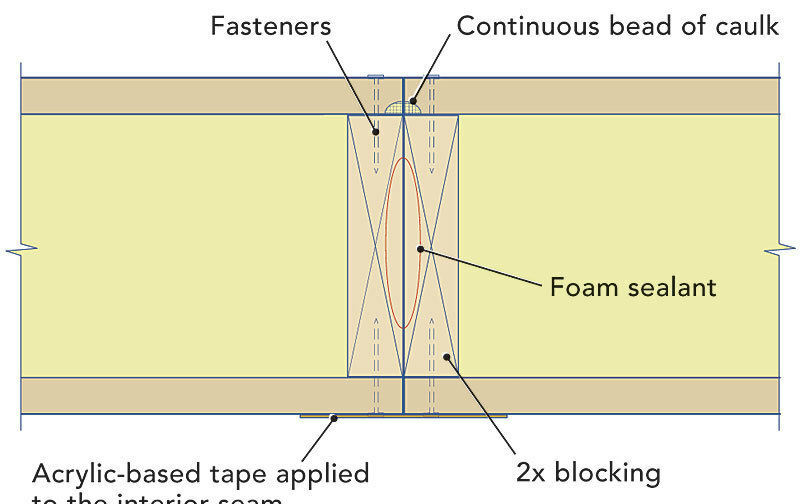 SIP seams aren’t exempt from leakage, so they must be air-sealed carefully. Air leaks through SIP seams can lead to rot or, in extreme cases, catastrophic structural failure. Until relatively recently, the use of caulk and spray foam satisfied the requirements of most SIP manufacturers. However, in 2001, a cluster of SIP failures in Juneau, Alaska, highlighted problems with SIP sealing methods. Juneau’s failing SIPs had OSB rot near panel seams; investigators concluded that air leaks through poorly sealed seams allowed the condensation of moisture from the exfiltrating air. 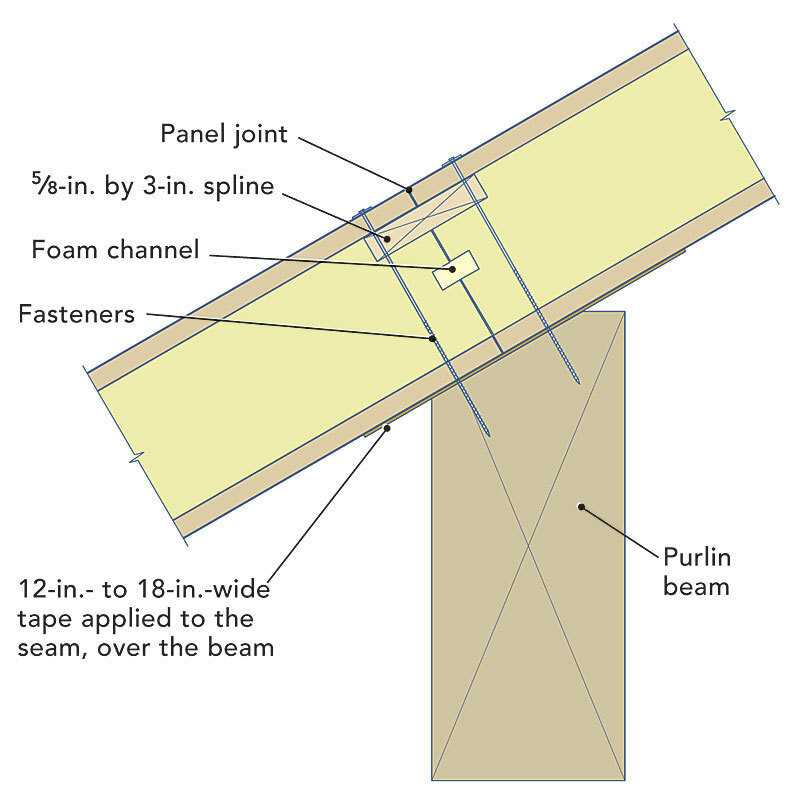 The Juneau failures showed that SIP seams sealed with spray foam don’t always remain airtight. Among the possible factors explaining these leaks: The weather conditions may have been damp or cold on the day that the seams were sealed, the workers may have been sloppy, or the panels may have moved due to the settling of the building or to humidity changes. Finally, there is some evidence that thin layers of spray foam aren’t always airtight. To seal interior seams, SIP contractors use a high-quality tape such as Siga Sicrall, Siga Wigluv, or R-Control SIP tape. Taping SIP seams can be tricky, though. 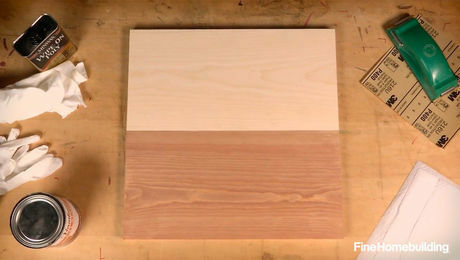 For example, when SIPs are installed over a timber frame, the timbers sometimes conceal the seams. The tape is then draped sticky-side up, with the paper backing left on the tape. Once the panels have been installed, the paper is peeled back and torn away so the tape can adhere to the OSB facing of the SIPs on each side of the beam. After the shell is complete, it’s always a good idea to verify the tightness of SIP seams with a smoke pencil while a blower door is depressurizing the building. 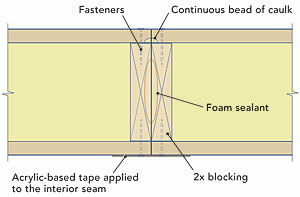 Most SIP manufacturers now recommend a belt-and-suspenders approach to seam sealing that includes spray foam applied between the panels, a continuous bead of caulk applied to the exterior seam, and acrylic-based tape applied to the interior side of the panel seam. 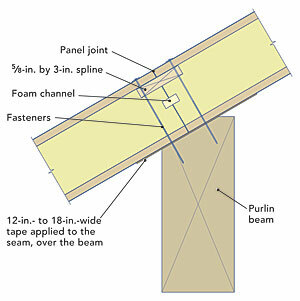 When the seam of a roof panel runs along or across a wide beam, installers need to drape a wide piece of peel-and-stick acrylic-based tape, with the paper of the sticky side facing upward, over the beam before the panels are set. As soon as the panels are installed, the paper backing can be torn away and the tape sealed to the panel on each side of the beam. 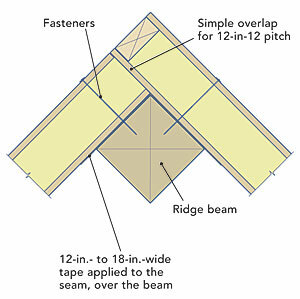 At the ridge, roof panels can be mitered or overlapped. 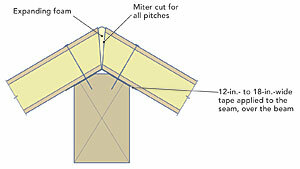 In either case, the interior side of the seam between the panels should be sealed with tape. Exterior gaps are filled with expanding foam. 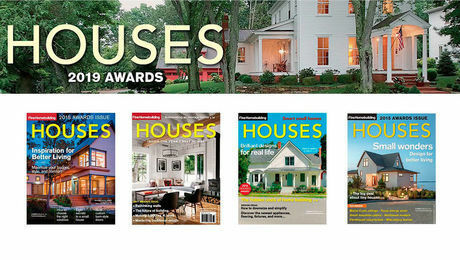 Most asphalt-shingle manufacturers prohibit the installation of their shingles on unventilated roofs. 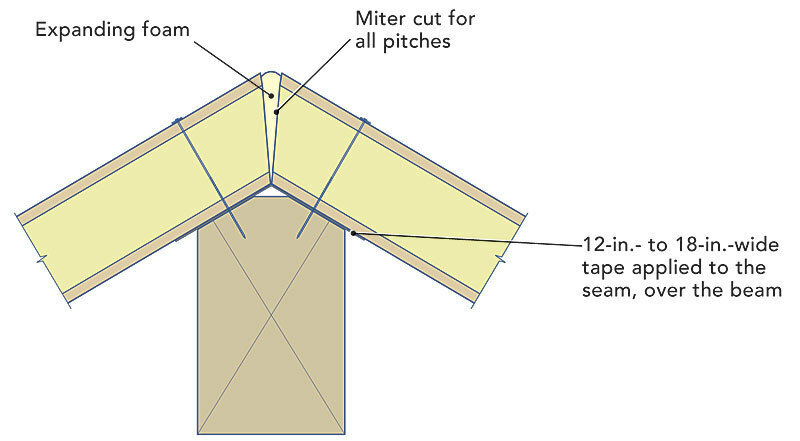 The easiest way to add ventilation channels to a SIP roof is to install 2×4 furring on the panels, then install the roof sheathing over the furring strips. Do SIP roofs need to be vented? 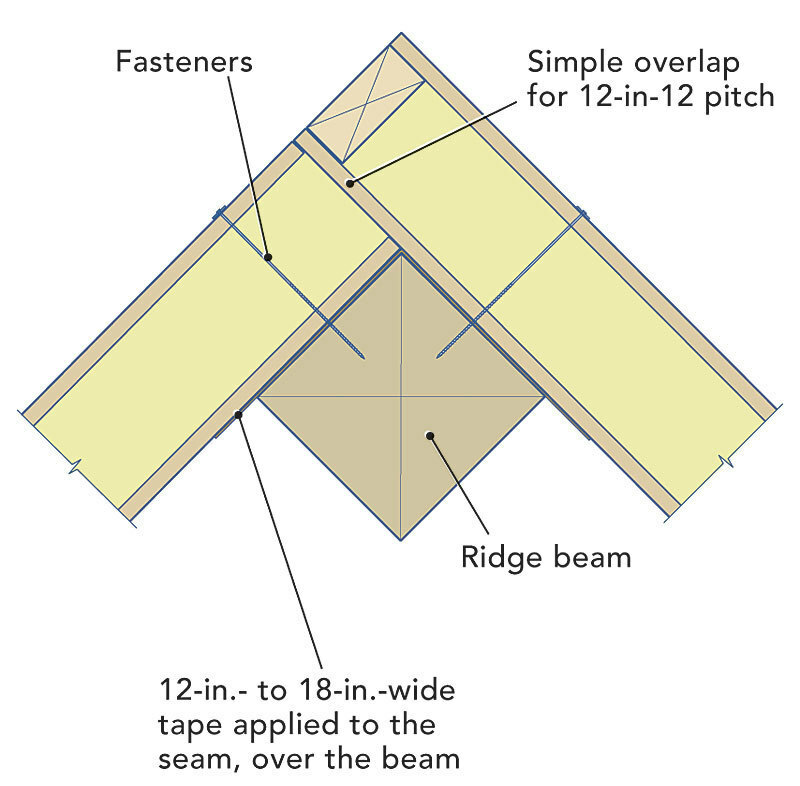 There are two ways to design a SIP roof. 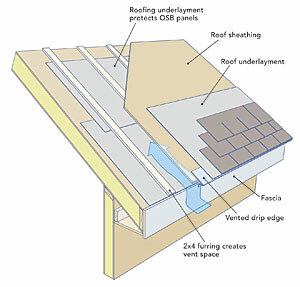 Contractors who install a so-called hot roof (an unventilated roof) fasten the roofing underlayment and roofing directly to the OSB facing of the roof SIPs. In short, if you are interested in reducing the chance that your roof SIPs will develop rot, ventilation channels are a good investment.